You are at:Home»Herbs»Tribulus terrestris Linn. Latin name : Tribulus terrestris Linn. Tribulus Terrestris (Gokhru Khurd), an Ayurvedic herb, is commonly known as Gokshur. This herb is most commonly used as an aphrodisiac, for urinary genital support, and sometimes, even for body building purpose. It functions as a potent herb for enhancing low libido. Gokhru Khurd herbal extract do not contain hormones, but induces the synthesis of hormone like Luteinizing Hormones (LH) and Testosterones. Gokhru Khurd has been widely used for sexual dysfunction in both; males and females. 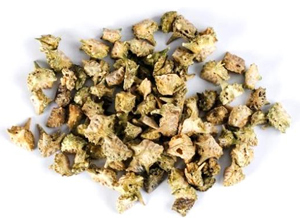 In China and India, the herb Tribulus terrestris has been touted as liver, kidney, urinary, and cardiovascular remedies. In Ayurvedic science, the herb is considered to be a general health tonic and urinary tract disinfectant. Contraindication : This herb has no known warnings or contraindications, but should probably be avoided by pregnant or lactating women.